Duck fat has been a mood this week in my kitchen. Duck fat roasted chicken wings. Duck fat roasted spatchcocked chicken. Duck fat roasted collard greens. 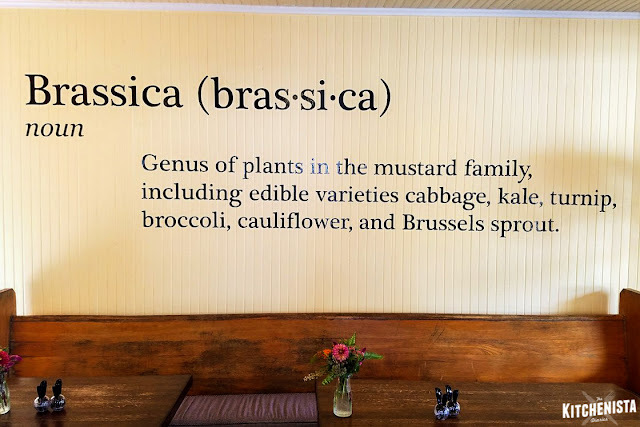 I'm here for the duck fat. It's a savory, luscious fat that can be used in place of butter for many recipes. You don't have to cook a duck yourself to get it. Two of my regular grocery stores carry tubs of rendered duck fat in the refrigerated meats section, the same brand also ships if you can't find it. It's slightly more expensive than good butter, but a little goes a long way. 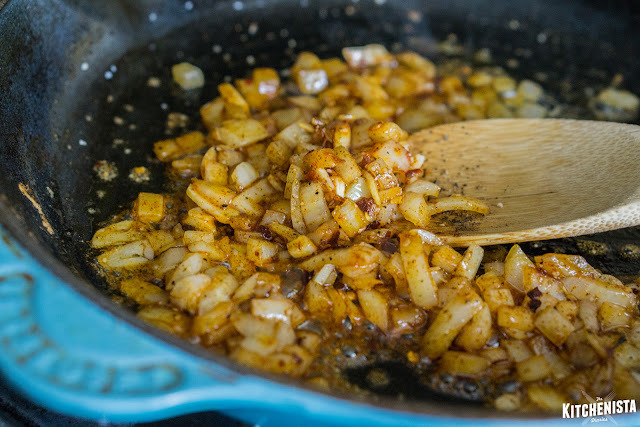 Duck fat is a big part of my Whole30 experience, not just because it's a healthy cooking fat, but because it makes my dishes feel special when a lot of other things have been cut out. Instead of olive oil and butter in the original recipe, I used duck fat. I also added about a cup and a half of homemade chicken stock, which added a tiny bit of pot liquor to the dish. 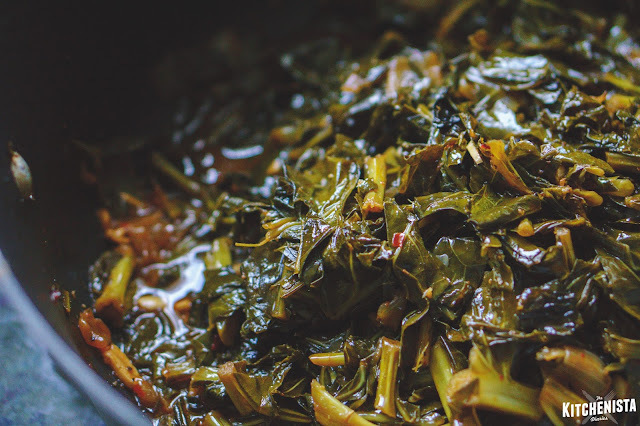 The result was really silky greens with a deeply savory flavor that tasted like they'd simmered with meat all night. I'm on day 3 of my Whole30 today, which has gone remarkably well so far. The sugar cravings haven't been as terrible as I expected. Mornings still leave me scratching my head for ideas though. During the week I eat a lot of dinner leftovers for breakfast or just something quick like boiled eggs and fruit if I'm on the go. But on the weekends, it's hard to hang out at home all morning and feel like there's nothing "fun" to make. Cutting out sugar, dairy and grains alone eliminates just about everything I would usually put on a brunch menu. But I do love my eggs, so I try to work around that. 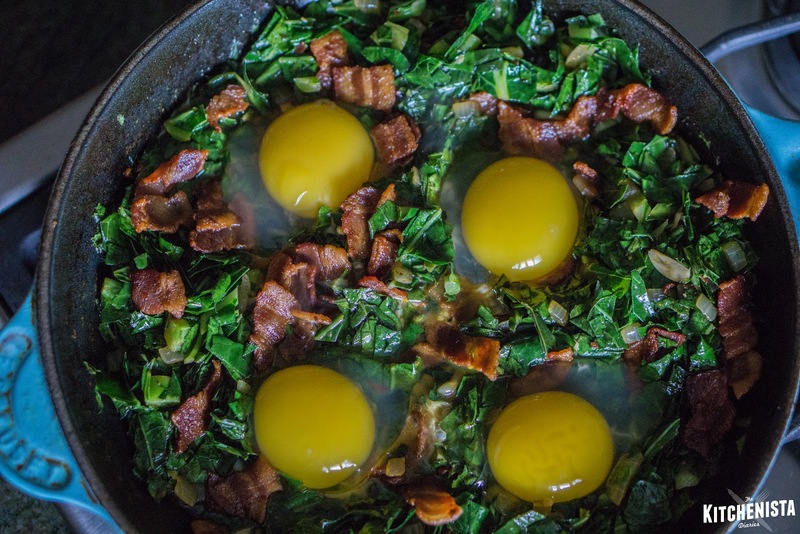 My obsession with duck fat led me to grab some duck eggs at the store this week, plus I had an extra bag of collard greens left in the fridge. 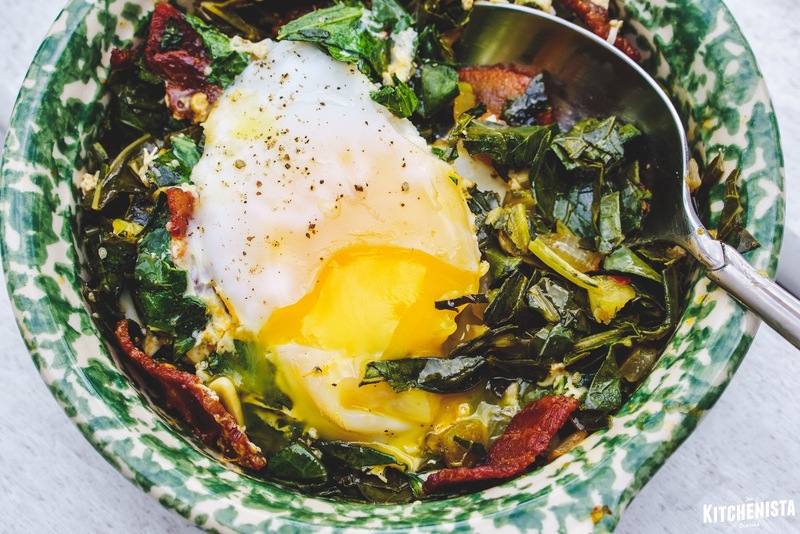 Baked duck eggs seemed like the logical next step, and that's exactly what I did. It might seem counter-intuitive to add duck fat to my ingredients when I've already cooked up some crispy bacon in the skillet. However, I used sugar-free, uncured bacon, which doesn't render as much fat as traditional bacon. 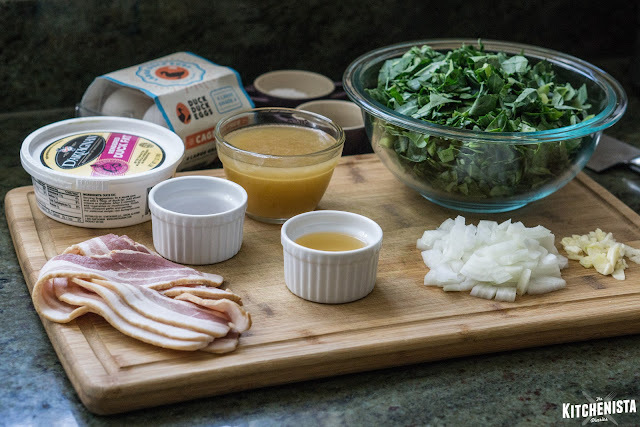 I also didn't want to the mask the flavor of the greens with a lot of bacon fat; I don't find duck fat to be as heavy. Some butter or olive oil will do the trick as an alternative. 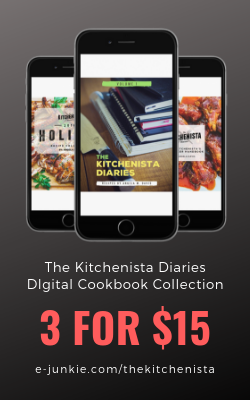 If you're not on Whole30 or you don't eat pork, consider taking this to the next level and making it with duck bacon instead. If you do that, you should get enough rendered duck fat without needing to add more; it will also have a nice smoked flavor to it. Because of the way most bacon is made, it's hard to find any variety without sugar in the ingredients. There is one brand I'm pretty familiar with, which happens to be a pork bacon, so that's what I used here. By the way, you can make this with regular chicken eggs. Duck eggs have a really large and richly flavored yolk, which is nice when the egg is the main part of the dish. Extra large farm fresh chicken eggs will have a similar effect, so if nothing else just splurge on a small pack of decent eggs. Do you see where I'm going with this? It's super versatile. Regular chicken eggs and pork bacon on one end, or duck eggs and duck bacon for the fancy version. Lots of ways you can modify for Whole30 on that spectrum, so just read your labels. Even though I just made this dish today, I was really excited to post it right away! 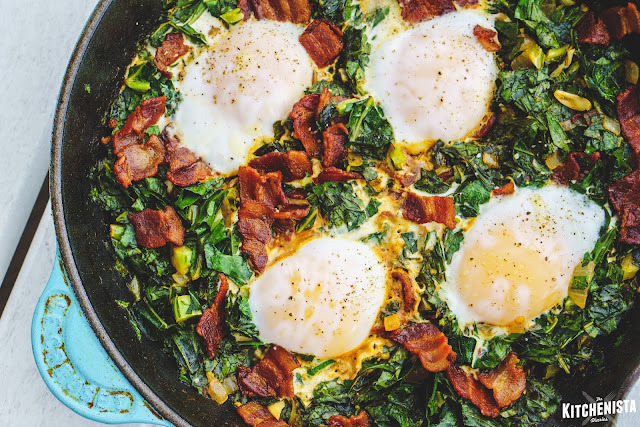 There's tons of ways you can tweak baked eggs to your liking, so hopefully the general idea gives you some inspiration to be a little more creative when you're running out of ideas for healthy breakfasts! 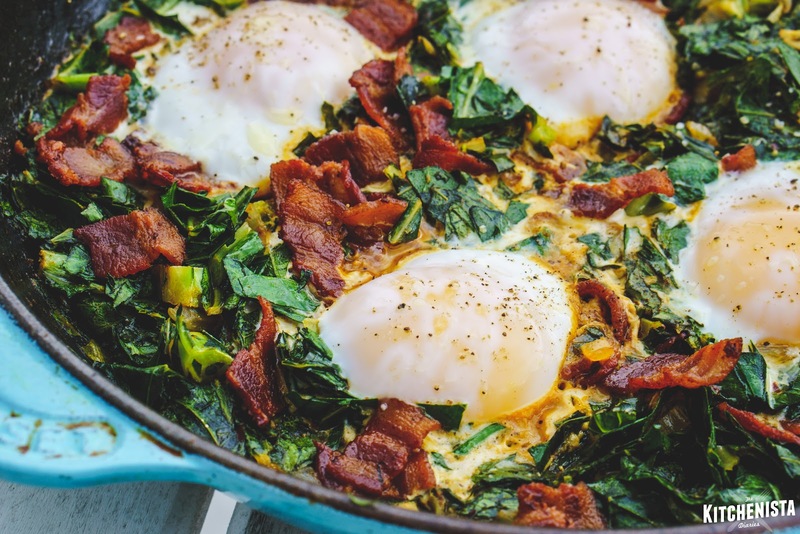 To make this dish Whole30 compliant, use sugar & nitrate free bacon. Read your labels on chicken stock if not using homemade. 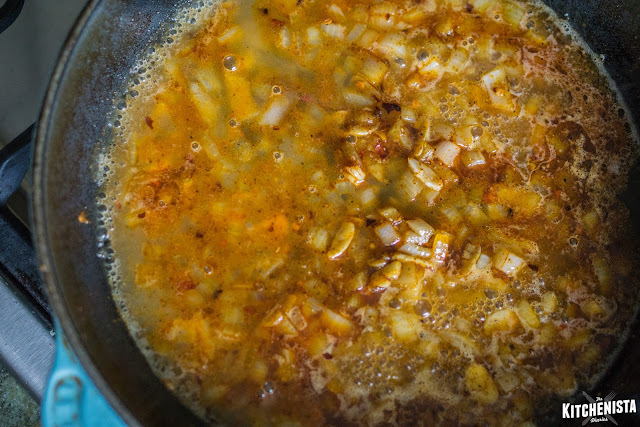 Duck fat and olive oil are Whole30 compliant, but butter should be replaced with clarified butter or ghee. Place chopped bacon in your skillet and over medium heat, cook until crisp. Remove bacon and set aside on a paper towel lined plate. 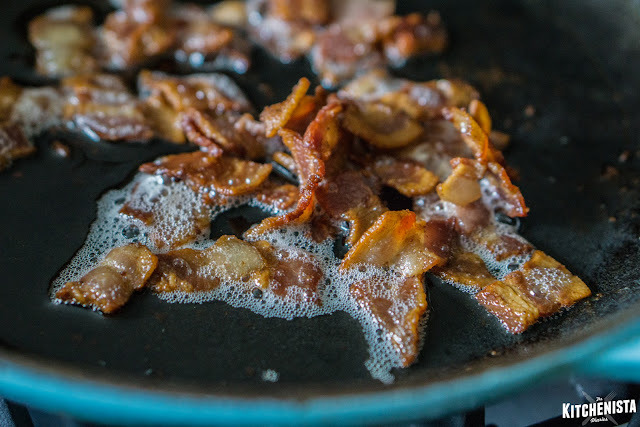 After the bacon cooks, preheat your oven to 400° F.
You should have about 2 tablespoons of bacon fat left in the skillet, otherwise supplement with a spoonful of duck fat, butter or olive oil. 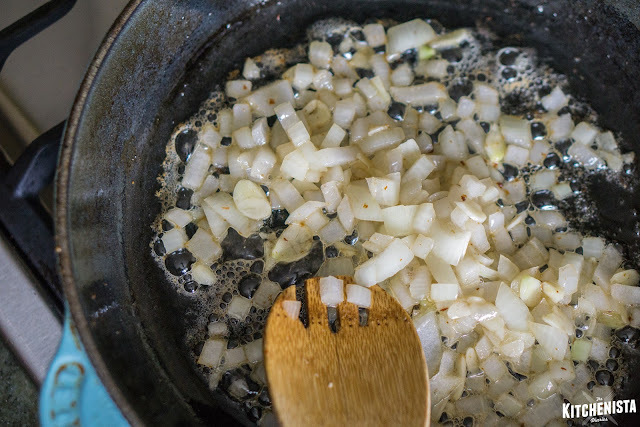 Add the diced onions and cook for a minute to soften. Add the sliced garlic and cook for another minute. Add the pepper flakes, paprika, black pepper and a good pinch of salt. Stir and cook for thirty seconds or so until fragrant. Pour in the vinegar and stock to deglaze the pan, scraping up any browned bits. I keep a container of homemade chicken stock in my fridge for small tasks like this. Water will work in a pinch though. You really are just creating a bit of sauce so the greens don't dry out. A little bit of coconut milk could work too, for a creamier effect. Let this simmer for a few minutes until it reduces slightly. You want to see enough liquid to cover the bottom of the pan. Add the chopped greens. If you're using bagged greens you may want to give them another rough chop with your knife as they tend to come in bigger pieces. 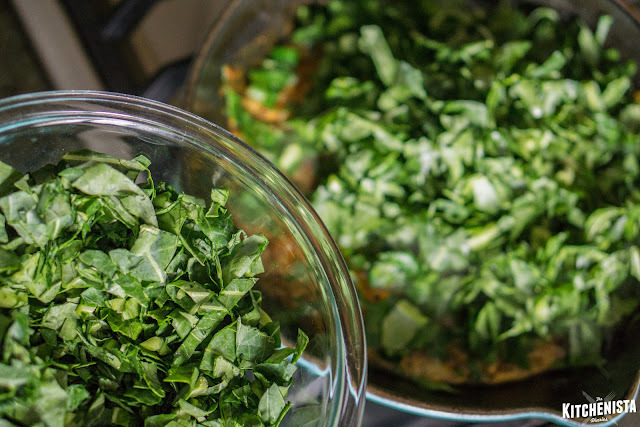 Sauteed greens work better when cut into smaller slivers. Toss the greens into the liquid and as they begin to wilt, add the duck fat (or whatever extra oil you're using.) Stir to coat the greens in fat. Season to taste with salt and pepper, if needed. 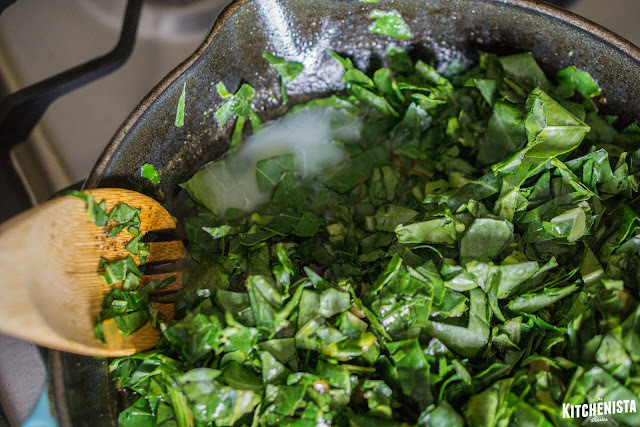 Make four little wells in the greens for your eggs. 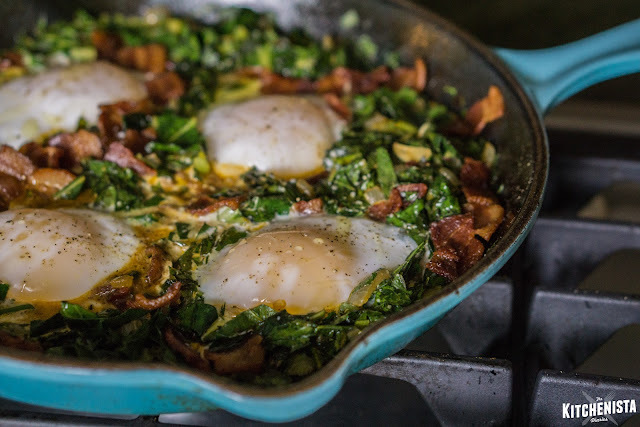 Try to make sure there's still a layer of liquid and some greens at the bottom, so the eggs aren't cooking directly on the skillet. Crack an egg into each well. Sprinkle with a pinch of salt. Transfer the pan to the oven and bake at 400°F, for about 12 minutes or until the whites are set and yolks are still runny. You can cook a couple minutes longer if you want more of a custardy yolk. If you don't want to do this in the oven you can put a lid over your pan and steam the eggs over low heat. Just keep an eye on them this way; sometimes they cook a little too fast from the bottom before the whites catch up. I finished this off with pinch of cracked pepper over each egg. 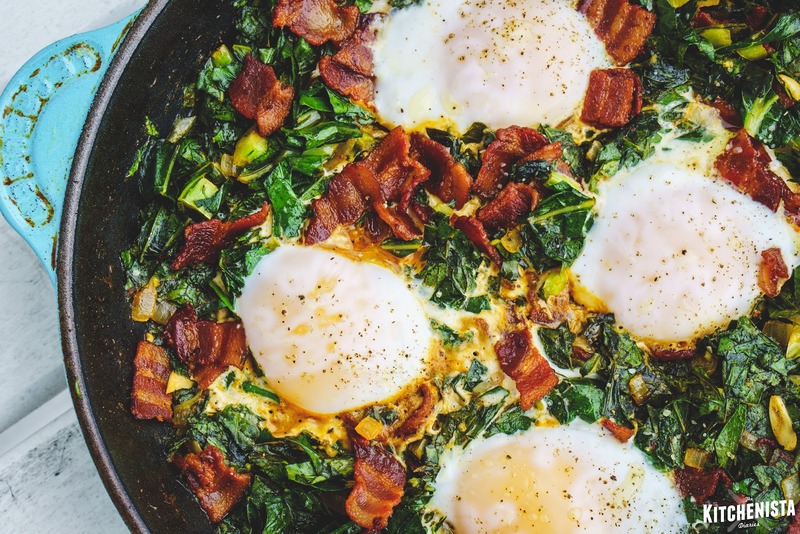 You'll want to serve immediately while the yolks are still runny. The egg whites seep into the greens which helps to set everything, so it's easy to scoop out a big section onto your plate or bowl. A dash of hot sauce would definitely be appropriate. My favorite part of any dish with baked or poached eggs is always breaking into the yolk and letting it ooze all over everything. 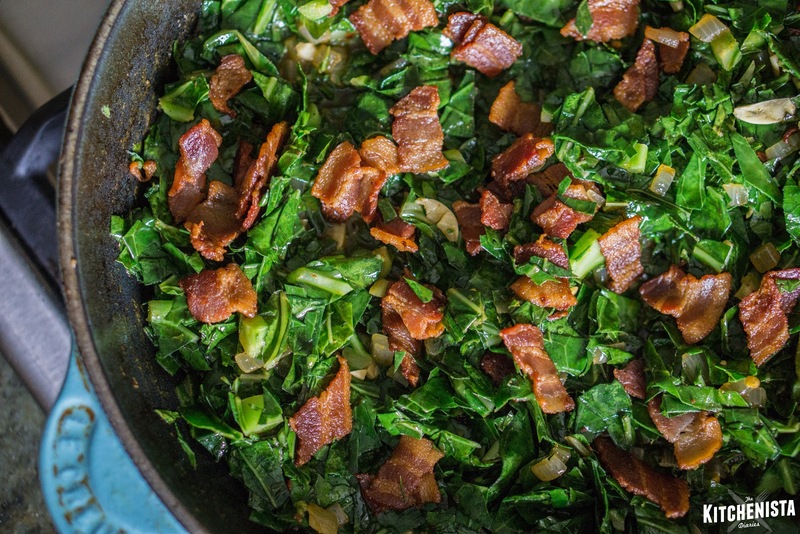 The greens have a bit of bite left and the crunchiness of the bacon adds another textural contrast. 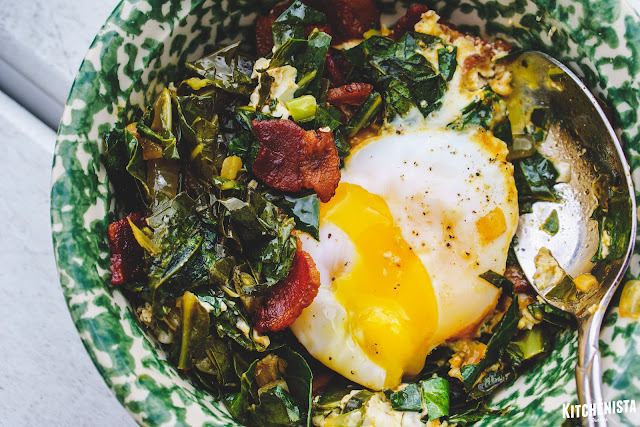 Even though it's healthy, it's still all the things that are great about breakfast in one bowl. This was so good I sat outside eating after taking pictures and never made it back to the table! Hi. My #backtobloggingweek went from calm and blogging-friendly to "why on earth did I think I could do this?" within a matter of a few days, ha. But I'm here, and I will double up on recipes this weekend, so technically nothing is lost, right? Right. In other news, September 1st marks my first day back on the Whole30 train in about a year. It's going to be a challenge. 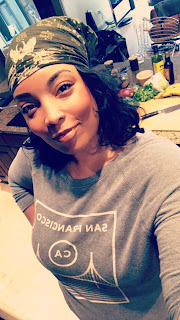 But I'm here for it, and low key excited to get back to cooking the things that are better for me to eat. I will get into all of that in future posts. For now, something quick. Literally. I'm not sure why I decided to torture myself looking at these photos but out of all the content I had set aside to potentially post, this one stands out as something you should definitely try before summer is officially over. 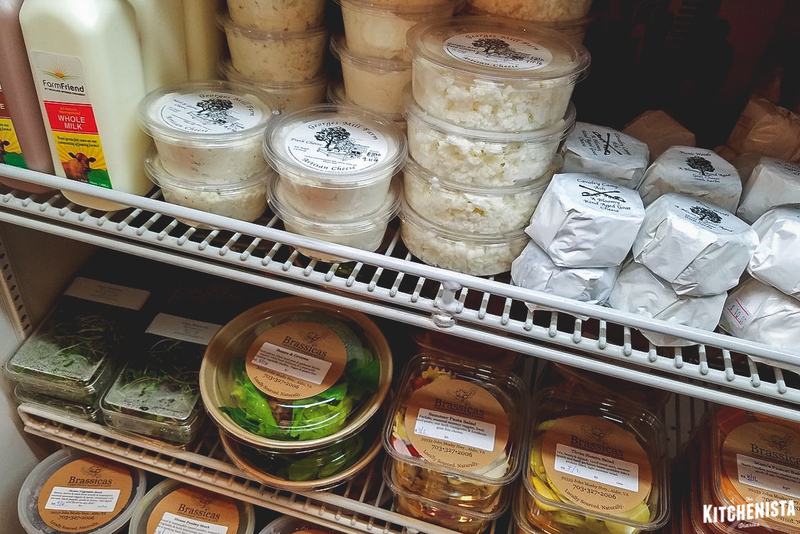 One of my favorite things to do in my free time is visiting local farmer's markets and artisanal food shops, especially in the summer. Last summer my commute took me through Aldie, Virginia, a small town off Route 50 in Loudoun County. 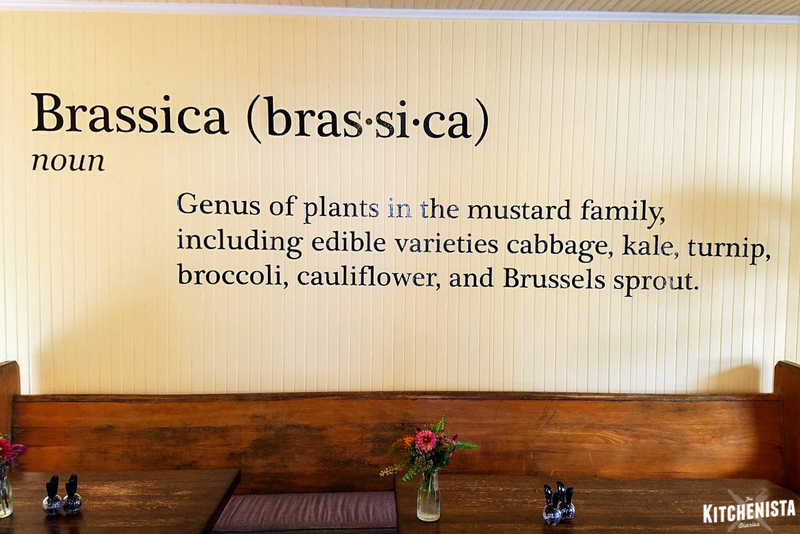 There's a little store on the side of the road called Brassicas Farm Fresh Market & Café. The first time I had the opportunity to stop in, I fell in love instantly. They offer a small made to order menu and some prepared foods, local wines and craft beers, goods from area farms such as dairy, eggs, and meat, fresh baked bread, and gorgeous produce from their own garden out back. 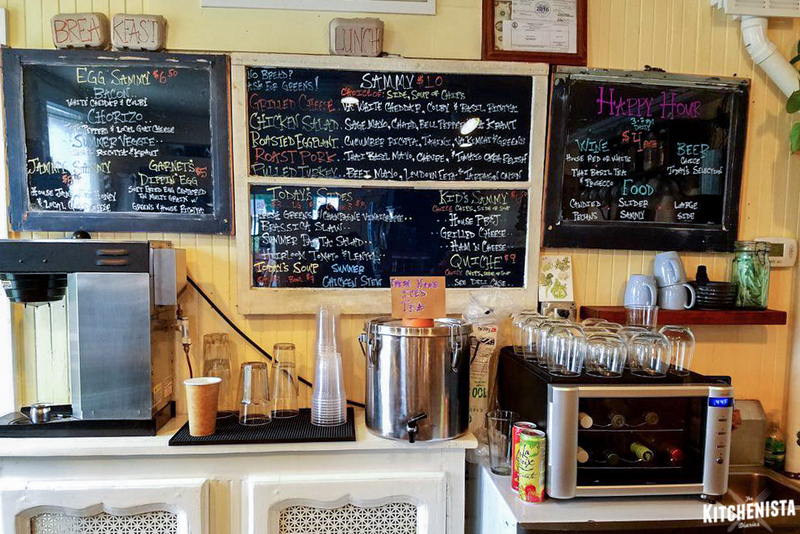 It's a charming place and both the owner and staff were always friendly. Hopefully I'll get a chance to swing by again soon. Unfortunately my current commute takes me in the opposite direction these days. This makes a light dinner, lunch, or (cut into smaller pieces) an elegant crostini appetizer. The quantities don't matter here...just make enough for what you plan to eat right away. If you can't find microgreens, use a bit of finely chopped basil. Use a good quality honey for a real treat - you can often find them near the cheese counter or at artisanal shops. I've tried this with a spicy honey, lavender honey, and truffle honey. Same with the salt. I used a smoked Maldon sea salt. If you have a fun finishing salt you've been itching to try, go for it. 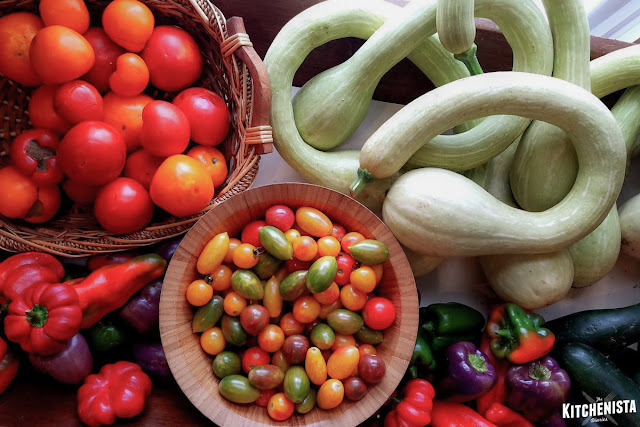 You don't need much, just a pinch to bring out the flavors of the tomatoes. 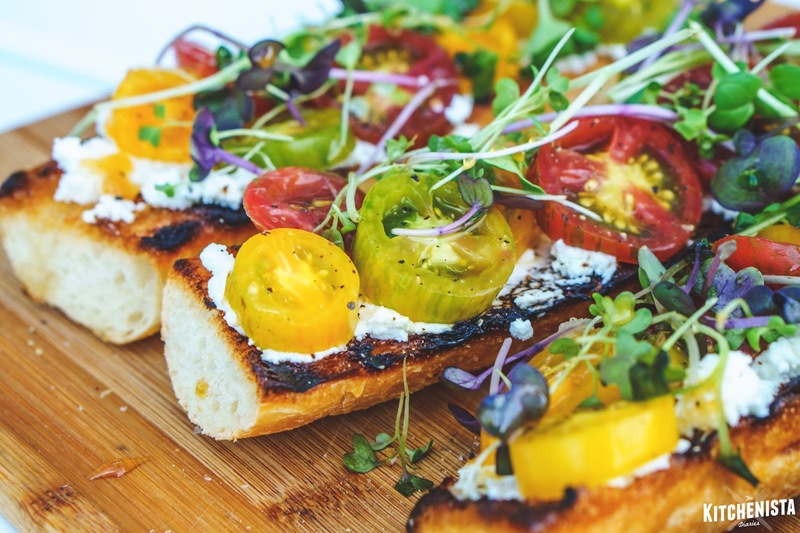 Cut cherry tomatoes into thin slices. Season with a pinch of salt and pepper and toss together in a small bowl. Set aside to allow a few minutes for the juices to start releasing. Preheat grill pan or skillet until just shy of smoking. 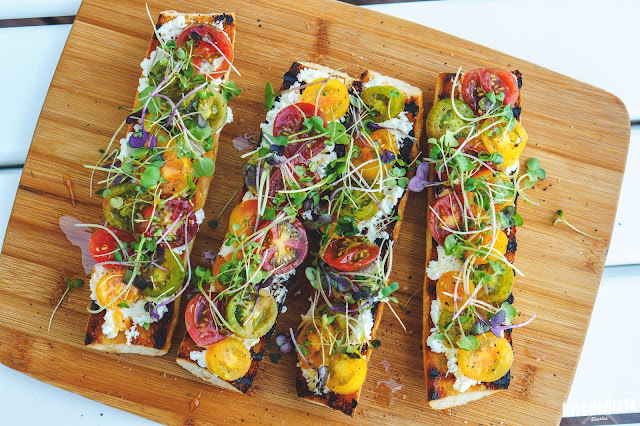 Cut the baguette in half lengthwise, then into pieces that can fit comfortably across your grill or skillet. Drizzle generously with olive oil. Grill the bread for a minute or two, until nicely toasted and charred in spots. Set aside. 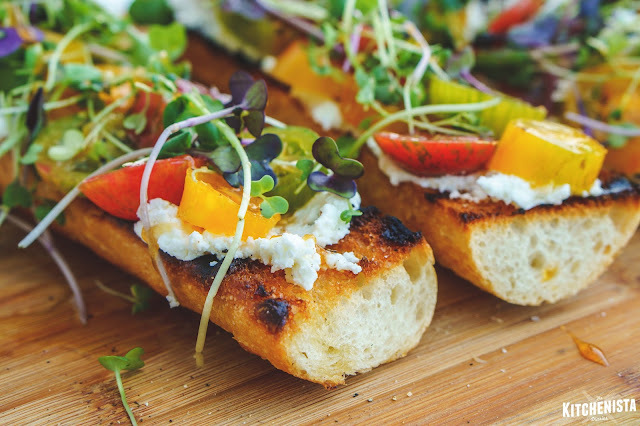 Once bread is cool enough to handle, smear it with the goat cheese. Top with sliced tomatoes. Drizzle the tomatoes lightly with honey. 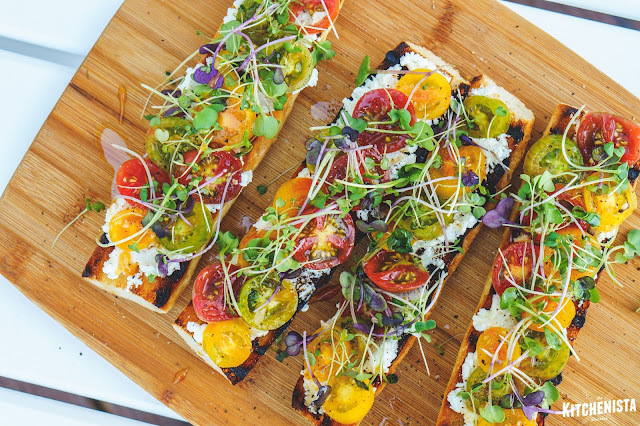 Top with microgreens. Drizzle lightly with olive oil. Serve immediately and wait for your credit score to increase.